Semyon Varlamov’s 2.94 goals-against average is 33rd among the 47 qualified NHL goaltenders. His .909 save percentage is 28th. The Avalanche’s veteran Russian is playing “better” than that. No, I’m not talking about Varlamov being relentlessly larcenous so far. He’s not threatening to again be among the three finalists for the Vezina Trophy, as he was in 2014. At some point, if the Avalanche is going to pull off the stunning single-season rebound to a playoff spot, he’s going to have to flat-out steal more games — and again be among the elite. The top goalies, or even mediocre ones, can go through those streaks when nothing seems to get past them, and it will take a run or two like that from Varlamov for Colorado to make the postseason. But it’s about reliability. While his teammates’ praise at times is pro forma, smacking of what they’re supposed to say, the truth is he has held up well enough to give hope that he can be more of a difference-maker in the second half of the season. If Varlamov gets the benefit of the doubt, to an extent so should Jonathan Bernier, the veteran signed in the offseason and expected to be an upgrade as the backup. But Bernier (3.29 and .893) clearly has struggled, with the exception of one-goal games against Anaheim early and then a 39-save night at Pittsburgh on Dec. 11. 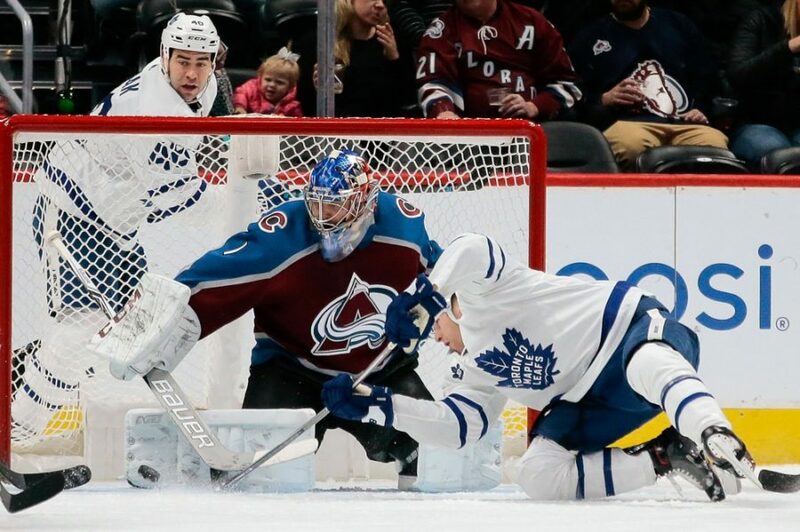 Varlamov has made 24 starts and also came on for the yanked Bernier in a 7-2 loss to Dallas at home on Dec. 3. “It’s a completely different team this year,” Varlamov said at Family Sports Center Saturday. “Great atmosphere in the locker room. I think we’re playing better defensively. D-zone coverage is definitely better than last year. It’s easier to play for the goalies, you know? He was out for a three-game stretch in Thanksgiving week because of illness, and he’s on track to start about 56 games. As the tenured veteran goalie on this team, he certainly is consulted about his workload and what might be appropriate spots for nights off. But this isn’t quite when Patrick Roy essentially plotted out his own schedule in the Colorado crease, ending up playing from 61 to 65 games for the Avalanche. Is Varlamov’s workload about right? Varlamov’s final appearance last season was Jan. 17, and the Avalanche shut him down a little over a week later before he underwent the hip surgeries about two weeks apart. Varlamov’s groin muscle issues actually were a factor in the sequence of events that led the Capitals to trade his rights to Colorado in 2011. General manager George McPhee — now with the Vegas Knights — was wary of re-signing the then-young Russian to a new deal appropriate for a long-term No. 1 goalie. The Avalanche stepped up and acquired Varlamov for a first- and a second-round pick and signed him to a three-year, $8.5-million contract. He now is under contract through the 2018-19 season, with a $5.9-million annual cap hit. Early in 2017, that contract seemed on the verge of being an albatross, but Varlamov has made it back. Only Erik Johnson, Gabe Landeskog and Tyson Barrie remain with the Avalanche from Varlamov’s first season with Colorado, so the turnover in a little more than six years has been nearly complete. He also turns 30 on April 27. On the current Avalanche roster, only Carl Soderberg, Blake Comeau and Johnson (by 37 days) are older. In the NHL, time flies. Not as fast as a puck coming at a goaltender. But fast enough.